Do you ever get hooked on a certain food and then end up eating it ALL THE TIME? Right now that food for me is turkey. Why? I have no idea, but I'm just thankful to be craving lean protein instead of the usual suspects (chocolate, coffee, coffee with chocolate...). This past weekend I had a pool party/ barbecue to go to and wanted to bring something amazing to put on the grill. 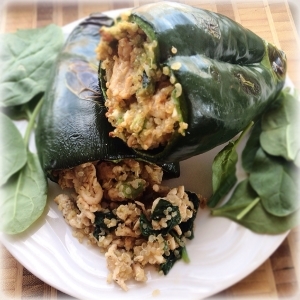 Just a little bit of kitchen creativity yielded these turkey stuffed poblano peppers. The poblanos add just the right amount of kick to the healthy combo of lean turkey, avocado, greens, and quinoa. In a small saucepan, add 1/2 cup quinoa to 1 cup water and bring to a boil over high heat. Reduce heat to a simmer. Cover and cook for 15 minutes. While quinoa is cooking, cut the tops off the peppers and remove the insides. Sautee the garlic, turkey, and seasonings in coconut oil on medium heat for about 3-4 minutes, or until the turkey is thoroughly cooked. Add spinach and cook for another minute or so until the greens are slightly wilted but still bright green. In a mixing bowl, combine quinoa, turkey mix, avocado, and feta cheese. Pack the stuffing into the peppers. Bake for 30-40 minutes, or until the peppers are wrinkly and the skin begins to bubble. Let cool for several minutes. I think they're best enjoyed fresh out of the oven, but they also make great leftovers! Turkey is a great source of lean protein, as well as selenium, niacin, and vitamin B6. It's also particularly high in the amino acid tryptophan. Tryptophan is famous for helping us sleep (that post Thanksgiving meal snooze), but it's also a precursor to serotonin- the chemical that stabilizes our moods. 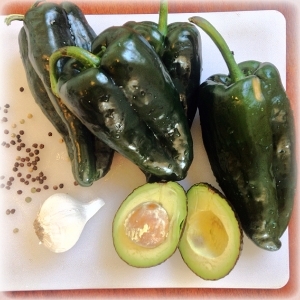 Poblano peppers are high in vitamin C- just one pepper should meet your daily requirements! Avocados are packed with healthy fats, fiber, and minerals. These fats are what keep you satiated and ward off carb cravings. Spinach is a powerhouse of micronutrients such as calcium, magnesium, anti-oxidants and phyto-nutrients. These nutrients aid in almost all of our body's vital functions and are co-factors to a healthy metabolism. Garlic is a sulfurous food, making it an excellent detox agent. It is also great for digestion and boost the immune system.